The oxy 1.5 aerator is designed for sites which require small amounts of oxygen. The device weighs just 35 kg and is easy to move. The Oxy 1.5 can be equipped with a 1- or 3-phase motor, meaning it can be connected to a power network wherever. Unlike other Waterix devices, Oxy 1.5 does not have an intake pipe. In addition to aeration, the Oxy 1.5 also forces water to move. 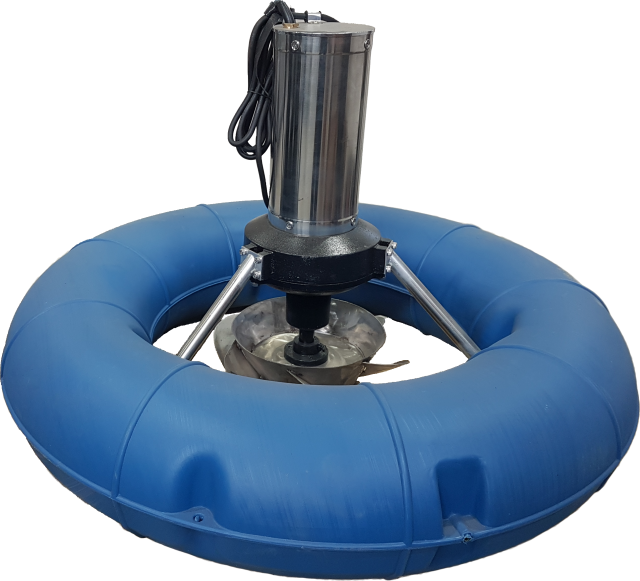 Due to its compact size, the Oxy 1.5 is suitable for small and medium size ponds and for aerating fish and crab pools fairly sufficiently. Another typical application is to prevent fish death in small lakes or near your own shore, and in park and golf course ponds. It is possible to equip the Oxy 1.5 with lights for an attractive appearance.